Police union bosses Pat Lynch, of the Patrolmen's Benevolent Association (C) and Sergeants Benevolent Association Ed Mullins vehemently denied that police used a chokehold during their arrest of Eric Garner. CIVIC CENTER — The city's police unions vehemently denied Tuesday that Eric Garner was put in a chokehold during an arrest before his death — following a firestorm of criticism of the department they say has been fanned by mayor Bill de Blasio's rush to judgment in the incident. 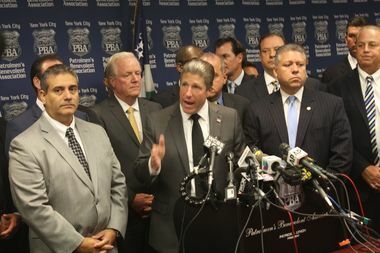 "It was not a chokehold," Patrolmen's Benevolent Association President Pat Lynch said Tuesday at a press conference at the union's headquarters. "He was a big man who had to be brought to the ground to be placed under arrest by shorter police officers." "Sometimes the use of force is necessary. But it's never pretty to watch," Lynch said. Lynch, who was flanked by Sergeants Benevolent Association President Ed Mullins and other police union members, also rejected the video of the incident and the city Medical Examiner's autopsy report that called Garner's July 18 death a homicide and said it was caused by a chokehold. "I've never seen a document that was more political than that press release released by the [Medical Examiner's] office," Lynch said. "We spoke with experts who had never seen it released the way it was, without the facts behind it, without the Medical Examiner's report and in parentheses, 'Chokehold.' That's not a medical term." Lynch also took aim at de Blasio for not backing the department. "The mayor needs to support New York City police officers unequivocally. He needs to say it, and he needs to say it forcefully ... It is outrageously insulting to all police officers [to suggest] that we go out on our streets to choke people of color," he said. Lynch did not mention NYPD Commissioner Bill Bratton, who said after Garner's death that the arrest involved what would "appear to have been a chokehold." But he added that an investigation would determine what happened. Lynch and Mullins were angered that the mayor included Rev. Al Sharpton at a City Hall round table about the Garner incident, saying the controversial civil rights advocate has no place in the discussion. "Sharpton gets to determine the direction of justice in this city ... It's completely wrong," Mullins said, adding that there might be slowdowns in response time as police rank and file become more concerned about following protocol to the letter. Lynch added that Sharpton, whose past clashes with the NYPD have pitted him against police commissioners and mayors alike, doesn't belong in a discussion about police tactics, saying that's a job for elected officials. "I do not believe [Sharpton] has credibility…he doesn't have the right to make up facts," Lynch said. "The only one that'll dial Al Sharpton is someone who just got locked up with a gun and wants to be saved." De Blasio, who spoke at a simultaneous but unrelated press conference at Office of Emergency Management emergency operations center, said he is awaiting the results of an ongoing investigation, and supported the NYPD. "I have an immense respect for the men and women of the NYPD. They have a tough job and they do it very well," de Blasio said. But he said the criticisms of the police unions would not sway him. "Union leaders will say what union leaders say," de Blasio said. "We have a job to do, we're going to do our job. I don't let the rhetoric of union leaders get in the way of getting our job done." There's a full investigation underway. There will be a legal process…then the department will make its decisions," de Blasio added. Sharpton also weighed in on Lynch's comments. “It is time to have a mature conversation about policing rather than immature name calling and childish attempts to scapegoat," Sharpton said in an email statement. "To say that only people with guns call us, shows the reckless, immature manner in which some parties want to engage, because the fact is that all of the people who have called on us, who we have stood up for, from Sean Bell to Trayvon Martin to Amadou Diallo, those people did not have guns, but their shooters did."